"The Greatest Game Ever Played" was a game of golf, in case you thought your team might have been involved. In 1913, a working-class American amateur named Francis Ouimet defeated the great British player Harry Vardon to win the U.S. Open. Here is a movie that tells that story and exactly that story, devoting a considerable amount of its running time to the final rounds and playing like one a superb sports telecast. Because some of the opening scenes seem borrowed from other underdog movies, I was surprised to realize, toward the end, how gripping the movie had become. Shia LaBeouf stars, as Francis Ouimet, a poor boy who lives with his family across from a golf course in Brookline, Mass. From his windows and the front porch, Francis can see the golfers at play. So can his father, Arthur (Elias Koteas), an immigrant who steadfastly opposes his son's passion for golf: "A man should know his place." But Francis has a natural gift for the game and is encouraged by his mother (Marnie McPhail) and two players at the local club. As a teenager, he actually attends a demonstration by the great Harry Vardon. As for Vardon, we find that he, too, is a working-class boy, born across from a golf course. Or, more precisely, born directly on one, since in the first scene of the movie we see his family's home on the Isle of Jersey being surveyed by men who plan to tear it down for the construction of a course. He asks one of the men what "golf" is. "A game for gentlemen," he is told. 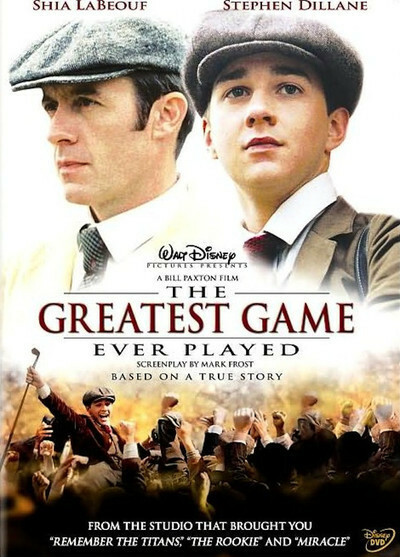 Harry is not a gentleman, but he is a class act, and as played by Stephen Dillane, he becomes a perfect foil in the great 1913 game. It would be too easy to make him a villain, but Harry and Francis both embody the tradition of generosity and good sportsmanship later practiced by Sam Snead. To Francis, Harry is an unspeakably grand man. But Harry sees himself in young Francis, and he knows that in the British class system he may be a great golfer but he will never be in the Establishment. The villain of the piece is Lord Northcliffe (Peter Firth), then the proprietor of the powerful Daily Mail and Daily Mirror, and the underwriter of the British team. He expects nothing less than a championship from Harry, confiding: "The prime minister has promised me a seat in his cabinet if I bring back this title." That seems a little unlikely, since to command the Mail and the Mirror was much more grand than a cabinet seat, but the fact that he would say it tells you a lot about him.The other central character in the story is a pudgy 10-year-old caddy named Eddie Lowery (Josh Flitter), who works for Francis for free and offers him sound advice with unshakable self-confidence. Eddie, who seems to be 10 going on 40, is one of those kids who always has and always will know it all; it helps that he is sweet. The movie also involves a romance with the fragrant Sarah Wallis (Peyton List), a young woman who begins a friendship with Francis that looks promising until the movie essentially sidelines it in the excitement of the Greatest Game. This is the second film directed by the actor Bill Paxton, and it could not possibly be more different from his first, "Frailty" (2001). In that one, he played a father who leads his two sons in a series of murders that were commanded, he believes, by an angel. "Frailty" was dark and brilliant and filled with fearful prospects; now this sunny film, which plays almost as if it's emotional rehab for Paxton. I am not a golf fan but found "The Greatest Game Ever Played" absorbing all the same, partly because of the human element, partly because Paxton and his technicians have used every trick in the book to dramatize the flight and destination of the golf balls. We follow balls through the air, we watch them creep toward the green or stray into the rough, we get not only an eagle's-eye view but a club's-eye view and sometimes, I am convinced, a ball's-eye view. The technique is at the service of a game in which everything is at risk, and we like both players; our affection for them makes everything trickier, and certainly as the final rounds are played, the games themselves seem to have been scripted to create as much suspense as possible. I have no idea if the movie is based, stroke for stroke, on the actual competition at the 1913 U.S. Open. I guess I could find out, but I don't want to know. I like it this way.